The channel was the result of the efforts of canny and able sawmill operators who knew how to get money and government help for their project. 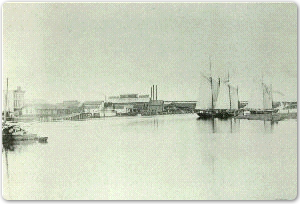 The harbor at Orange had always been attractive to shipping. Located on the Sabine River 12 miles above that watercourse's outlet to Sabine Lake, the harbor not only received barges of cotton from ports in East Texas but also timber. The timber was floated downriver from East Texas forests, made into lumber at Orange, and then shipped to Sabine Pass. There the cargoes were transshipped to New Orleans, Galveston, and other ports along the Gulf. The Orange harbor itself was blocked from serving ocean going vessels directly, however, by a shoal 'in the channel at Sabine Pass. Due to the shoal, only six or seven feet of water were present at low tide. Vessels drawing no more than four or five feet frequently dragged bottom in passing over this obstruction. Lumber interests at Orange tried to solve this problem by loading large vessels outside the Sabine Pass bar, but heavy demurrage charges were run up when rough weather made it difficult to get the barges alongside the vessels to be loaded. About 1885, the sawmill men at Orange Henry J. Lutcher, Samuel T. Swinford, the Bancrofts, and Judge D. R. Wingate were joined by John H. Kirby, a Tyler, Texas, sawmill owner, in consideration of a mutual venture to develop a harbor at Sabine Pass. They tried to plow the bottom of the channel by dragging it with a specially constructed massive steel harrow, pulled by powerful tugs, but this experiment was considered a failure. Real progress began when U.S. Representative Charles Stewart of Houston, whose district included Orange County at that time, secured passage of a bill through the U.S. Congress that appropriated money to build jetties protecting the entrance to Sabine Pass. Contracts were let, and brush mattresses were laid over the shoal and weighted down by quantities of stone. The channel was gradually deepened by the outward wash of the currents: as the years passed, vessels of gradually increasing draft could navigate the Sabine Pass channel. Some time later a government dredge was brought in to further dredge out the shoal. Sawmills at Orange and Beaumont now began sending heavy shipments of lumber across Sabine Lake to the new harbor at Sabine Pass. However, the lake was subject to sudden squalls that frequently damaged shipments, and a safer channel to Sabine Pass was needed. A conference was set up with Houston Congressman Ball aboard a boat that toured the lake, but no agreement was reached. While Orange was willing to leave the route of the new channel in the hands of the U.S. Engineers, Beaumont held out for a highland route or none at all. The project was abandoned for about 10 years more. In 1899 or 1900, Orange businessmen Dr. E. W. Brown, George Holland, and F. H. Farwell met with Colonel C. L. Wall and others from Beaumont at the Old Pleasure Pier in Port Arthur and formed an alliance to work against all opposition until the two harbors became deep water ports. The opposition came from Port Arthur, a new port created by the gift of the Port Arthur ship channel to the government by John W. Gates and the Kansas City Railroad. Port Arthur had become a sub-port of entry and opposed the use of her new ship channel by other cities attempting to develop their own deep water facilities. This problem was solved, however, when Orange and Beaumont helped Port Arthur become a full port of entry. In 1901, the efforts of Senator Joseph Bailey and Congressman Samuel B. Cooper resulted in appropriation by the U.S. Congress of $325,000 for the dredging of a 10 1/2 foot channel. But even with this improvement only barges and heavy tugs could go upriver, so the lumber men continued their efforts for even deeper dredging. Meeting at the Orange Elks Hall, Orange and Beaumont interests agreed to seek the creation of navigation districts in each county and to ask the Texas Legislature for authority to issue bonds for the development of the waterways. A proposal was made to pay half the cost of the development project if the government would pay the other half. Subsequently, the legislature gave the authority for the levying of a navigation tax in each county, and the voters in each of the counties approved the issuance of the bonds. H. J. Lutcher, J. W Link, W H. Stark, and Dr. E. W Brown, all of Orange, and Colonel W. S. Davidson of Beaumont went to Washington to confer with congressmen and senators and to appear before the U.S. Corps of Engineers with their proposal. Through the efforts of Congressman Martin Dies, Sr., and Senator Bailey, appropriations were approved in 1911. The work was completed in 1916 with the opening of the salt-water guard locks required by the Beaumont navigation district. About 1916, Stark and Brown deeded over to the city a tract of land for a port. The land was situated adjacent to the sawmills of the Lutcher and Moore Company (in which, incidentally, both men were heavily invested). The site was about two miles below the city, where a 3,000 foot-long slip was dredged to a depth of 26 feet. It was 200 feet across the bottom. City-owned warehouses and wharves were built on the lower side of the slip and equipped with the newest devices for the loading and discharging of cargoes. The upper side was occupied by the private wharves and loading docks of the Lutcher and Moore Lumber Company. They built an electric monorail system that could deliver 400,000 board-feet of lumber per day from their mill to the docks, loading several vessels at a time. Several years later all of these improvements were made part of the Intracoastal Canal system, a protected channel that rims the Gulf of Mexico just inside the borders of the Gulf states from Brownsville, Texas, to Florida. The harbor at Orange finally was opened to all the ports on the Gulf of Mexico and the world.